Hilde Domin was the daughter of the Jewish lawyer Eugen Siegfried Löwenstein (1871-1942) and his wife Paula Trier. Hilde studied at the universities of Heidelberg, Bonn and Clogne and at the Humboldt University in Berlin. She was no friedn of the nazis and in 1932 she emigrated to Rome with her friend Erwin Walter Palm, who was an author and studied archeology. In 1935 she received a doctorate in political sciences in Florence and in 1936 she married Palm at the Palazzo dei Conservatori in Rome. Between 1935 and 1939 she was a language teacher in Rome. In 1939 they moved to England and in 1940 to the Dominican Republic, where she was a translator, a photographer of literature and a lecturer at Santa Domingo University. By 1946 she had started writing and when her mother died in 1951 at a time she already felt lonely and estranged from her husband, her writing saved her from committing suicide. In 1954 she returned to Germany with her husband. They settled in Heidelberg, where she continued her writing. Palm died in 1988 and Hilde Domin lived on until 2006. 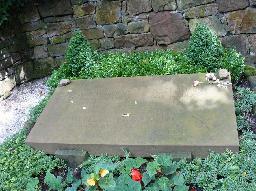 She is buried at the Bergfriedhof in Heidelberg in the same grave as her husband and immediately next to the grave of the poet Friedrich Gundolf. At the cemetery several markers indicate the way to her grave, indicating she had active followers at the time of her death. 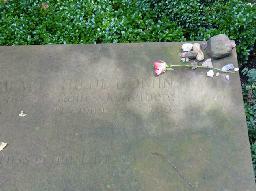 The grave of Hilde Domin at the Bergfriedhof, Heidelberg.